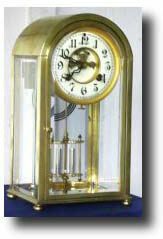 Waterbury Crystal Regulator, "AUCH" Model, c. 1912 Case: Cast brass and beveled glass with Ivory porcelain dial. 101/4" tall. Works: Waterbury 8 day time and strike on gong. Reference: Waterbury Clocks bt Tran Duy Ly Condition: Case: excellent. Works: excellent. Comment: One of a series named after European cities.